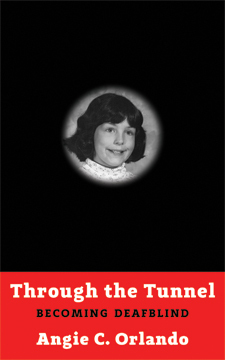 Through the Tunnel: Becoming DeafBlind. 5 x 8 trade paperback. Using a mixture of prose and poetry, Angie C. Orlando shares indelible stories about growing up in a small Ohioan town, complete with posing for family pictures, watching high school football games, and playing saxophone in a marching band. Yet she is equally funny and unflinchingly honest about how classmates, medical professionals, and others have viewed her multiple disabilities, all of which had gradually became apparent over time. Through it all, she leaves her abusive husband and endures her brothers suicide to become her own person. Angie C. Orlando lives in Kent, Ohio with her son and two cats. This is her first book.